Inspiring Ideas with artist Jeanne Winters: Help Others With Your Stories! Help Others With Your Stories! 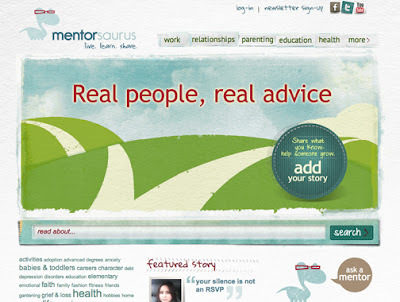 A brand new online mentoring site!! Mentorsaurus is all about giving others the benefit of our hindsight. Encouraging others who are now traveling some of the paths of life we've taken. It's a community-built website full of stories by real people – sharing real advice, encouragement and tips. I've been a part of building the site, so am especially excited about its launch! I, and others you may know, have contributed our stories – will you join us? If you're not a blogger, this is a place you can pop on to share your thoughts here and there to help others as you wish. If you have a blog or website, you can enjoy the benefit of a linkback to your own endeavors – expand your reach and grow your audience. What do you think? Check it out and let me know your thoughts! Read the Writing Guidelines for ideas and the About Mentorsaurus page to learn more! You don't have to be a writer to contribute – you just need a desire to help people... something I know all of my readers have! You're the best!! 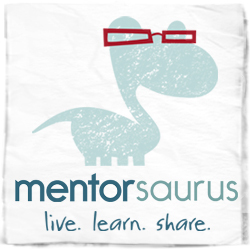 AND ... mentorsaurus is on all the social media – will you help spread the word??? You can "like" mentorsaurus on facebook, "follow" them on twitter and sign-up for the newsletter. Share the link via email and post about the site on facebook or your blog. Grab a fun button for your blog or website. Thanks so much!!!! I needed to write down a brief notice in buy to thanks for all the fantastic suggestions you're placing at www.jeannewinters.com. My prolonged internet lookup has at the finish of the day been recognized with reliable details and techniques to trade with my co-workers. I would assert that several of us readers really are seriously lucky to live in a important location with quite several excellent individuals with insightful pointers.